On the coast, the only material of better quality than aluminum is stainless steel. Stairways, Inc.'s stainless steel spiral stairs use alloy #304, although, any grade of stainless can be utilized. If corrosion resistance is the main concern for an exterior application, mill finish will be the most economical. All levels of finishes, #1 through #7 are available, #4 being the most common. If a color match will be required, stainless steel spiral stairs can be coated with a wet paint or powder. 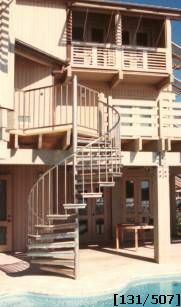 Stairways, Inc.'s stainless steel spiral stair models include welded (shown in the photo), standard kits and heavy duty kits - all of which are suitable for interior or exterior applications. All CNC patterns shown in the �Component Parts" section are available on steps and landings. To see the available parts visit our website at www.stairwaysinc.com or they can be seen in Stairways, Inc.'s brochure. If a low maintenance spiral stair is what your project demands, at Stairways, Inc., this is the best of the best.